Ferrets are related to weasels, not mice or rats, and have a personality that just is endearing and engaging. They are very curious and agile, so will get into just about any space you can imagine. Their eyesight isn't great, they see best close to them, so beyond that, it must be a little fuzzy, which makes it easy to play hide and seek with them! Their sense of smell is amazing and they have the most interesting little scamper as they run, almost like really fast inchworms as they move their long body around. Ferret cages need to be secure, as they are smart and like to move things around and explore. A litter box in their cage is needed, and you may want to anchor it to the cage itself as they enjoy moving things around to entertain themselves. Food bowls also will be moved around if not secured. Your ferret will rearrange his entire environment to entertain himself. A ferret's diet is protein based, not vegetable based, so consider that when you choose your ferret chow. Ferrets also tend to have a musky odor, which is often lessened through baths or removal of the scent glands, but you should expect a bit of a unique smell. Ferrets live 7 to 10 years, so they are not a short-lived pet and they tend to be an animal that requires a lot of attention, as they thrive on playing with you. They will happily play with you for several hours a day, but they will also attempt to interact with whatever they come into contact with. 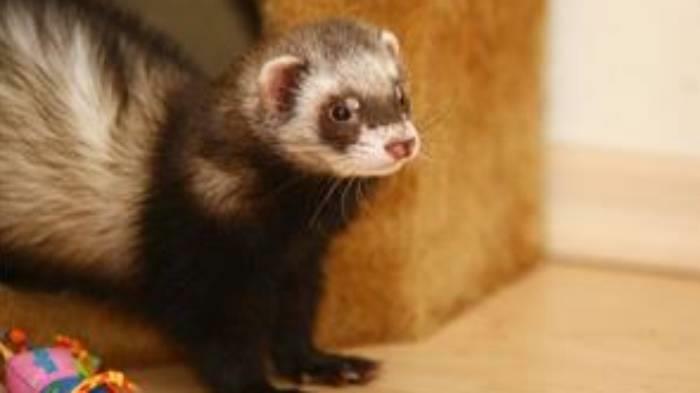 When I was in college, my brother and I roomed together, and he had Ferris the Ferret. I had just adopted a kitten, and named her Squirt. I have to admit, I completely fell in love with Ferris. He was engaging, energetic and hysterical. I laughed at him a lot. Most entertaining was watching him and Squirt playing. They would chase and play all over the apartment. The kitten soon discovered that Ferris could not see her if she was more than a foot to 18 inches away, and she could hide and ambush him. Her favorite thing was to get him chasing her, and then jump onto a footstool and whack him with her paw. It took him a while to realize that she was on top of the footstool and then the play would continue! I have wonderful memories of Ferris and the joy he added to our lives!